Last weekend on Saturday I did my second Day In The Life™ documenting day for 2017. 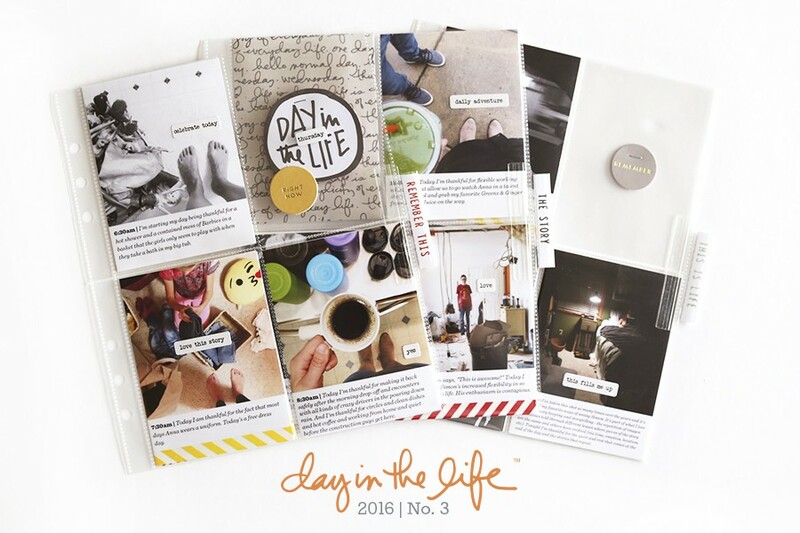 You can browse past Day In The Life™ projects here. The lens through which I decided to tell my story this time was using -ing word cards from the Day In The Life™ Summer Journal Cards (a digital version is available here). The last few times I've used the lens of each hour of the day as a foundation/formula for my storytelling so I liked mixing it up a bit. 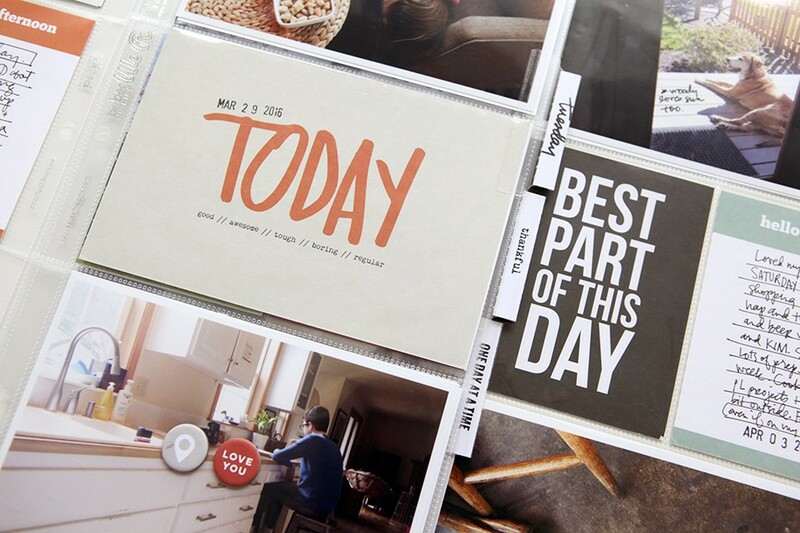 This is a super manageable project and such a fun way to capture what a day looks like at any given point in time. When I first started on this project I anticipated using the cards for journaling but then decided to add photos to the cards instead and include one journaling card that incorporated a bunch of the details of the day. I love that sometimes it can be more the photos that are telling the stories. I printed my photos sized to 3x4 and then cropped them based on the space available on the cards. I used my sewing machine to stitch the photos onto the cards before slipping them into the pockets. I also added a tab sticker from my Summer Release to a bunch of the photos. In between the two main page protectors I included one of the 5A Page Protectors that I cut down to just one strip of pockets. Inside those pockets I added pieces from the Day In The Life™ Summer Die Cut Pack. It was a cool way to incorporate a few more "playful" embellishments vs. adding them directly to my photos. Because the backs of the die cuts were blank I used this stamp set to stamp "saturdays" using StazOn on the other side. I also added a chipboard piece from the Summer Chipboard Shape Variety Pack. You might also notice that I added Avery Index Tabs (back in stock) along the edges of each of my page protectors. Inside on the tabs I used either the Day Of The Week Roller Stamp or the Phrases Roller Stamp. 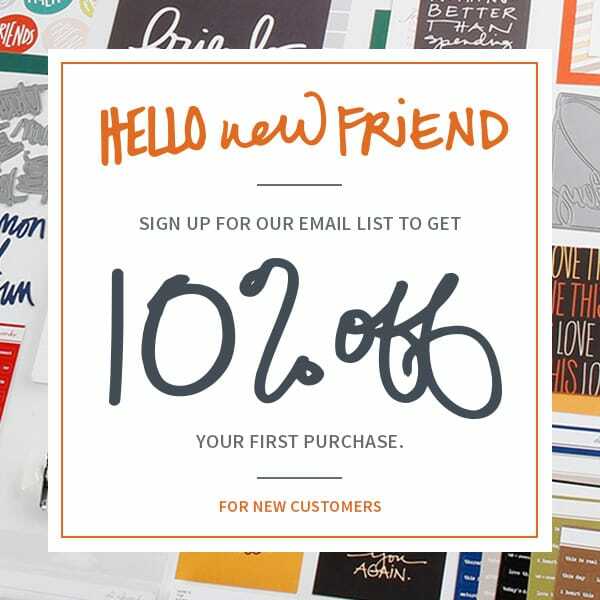 Love how universal those stamps can be for all kinds of projects. On the back I included the other -ing words plus a marketing card from the race Aaron and I did on Saturday afternoon. I totally loved this simple approach. It's nice to have different ways to tackle the same project. I'll be doing Day In The Life™ one more time this year - most likely in November. Details to come as it gets closer. Thanks for always reminding us that we can keep it simple. I keep needing to be reminded of this. This is beautiful. I backed off for this one, for the first time in four years. I love the idea of the -ing words, this was so inspiring, and I hope to do this idea soon. Oh, I also love how you did the 2x2 strip, so clever and cool. I really love the idea of stamping on the back of die cuts! Such a good solution. As always Ali...awesome. Love it. loved seeing how you approached this project. I bought the kit but did not end up using it as I was not sure how to approach with this kit. Thank you for the inspiration. A reminder to get in some photos- mine is all my family and my boys. You continue to inspire and shape my memory keeping style. Love your work, Ali! Also, as a side note, my 14yo is a new YouTuber and she videoed her "day in the life" and left credit to you in the description on her video. If you're interested in seeing it, let me know. 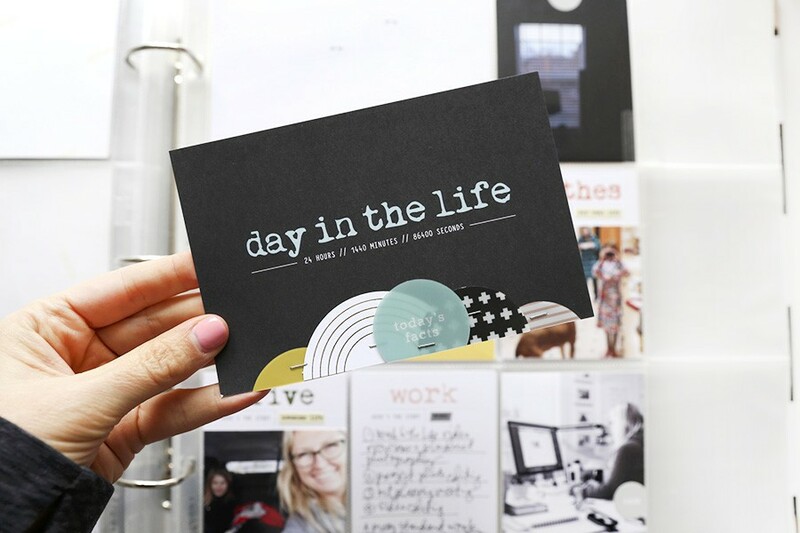 For years I've been way overthinking this day in the life project but now see it's so easy to incorporate it into my memory planner and I love this 'ing way of documenting the day. I'm off to check out the digital kit! Awesome! Here's to not overthinking it any longer! What a wonderful view of your day. I also love that you did a day where it was you and Aaron. I understand the desire to focus on those days when all of the kids are there, but it is also nice to capture other moments. 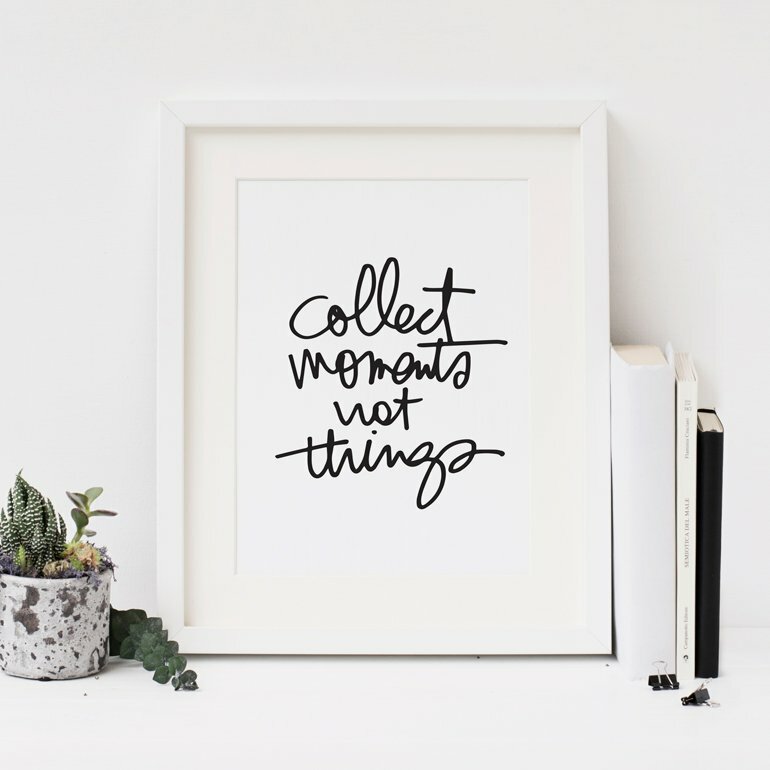 There is value to those days, and when I see people ignore them in their memorykeeping, it makes me sad, actually. It is as if they are trying to ignore that time, as if to say those days do not have value, as if days spent not with children are "less than," rather than simply different. And perhaps those pages look different, and there may be fewer of them, but those stories hold meaning as well. Cheers to ALL of the stories.